Abbi’s Circle is a unique cross-sector collaboration between animators, young primary school children, migration NGOs, a dramaturge, primary school teachers and university researchers. Combining documentary and animation Abbi’s Circle (a three-part animation series) dramatises real life stories of family separation. Following the adventures of Abbi and her circle of friends, we experience the obstacles facing migrants wishing to be reunited in Ireland with family members abroad. This short video documents the collaborative process behind the making of Team Spirit - the second animation in the Abbi’s Circle trilogy. Each animation in the series is accompanied by a teaching pack including lesson plans and teacher notes on the topics of diversity in the classroom, sport and racism, child labour, people in exile, and home and statelessness. The pack is a treasure trove of suggestions and ideas for the classroom. It is a refreshing new resource in a medium sure to grasp children’s attention. Content of the teaching packs was developed by Liz Morris and Niamh McGurk – teachers working in Educate Together schools. Liz teaches English as an Additional Language in Griffeen Valley Educate Together NS. She has previously worked as a class teacher in Rathmichael Parish School and in Plás Mhuire BNS in Dorset Street, Dublin. She has facilitated workshops and courses on Gaeilge (i gColáiste na Rosann, Co Dhún na nGall), Inclusion and Diversity and co-edited, with Susanna Coghlan, IBBY Ireland’s guide to multicultural books for children, Cross-Currents. Liz has also written educational resource materials for the INTO and The O’Brien Press. Niamh is a classroom teacher in Donabate/Portrane Educate Together N.S. She previously taught EAL in St Cronan’s JNS. Niamh has a Master’s degree in Intercultural Studies and has facilitated a number of lectures and workshops in the area of Culture, Challenging Stereotypes, Anti-Racism and The Inclusive Classroom. Niamh has written educational materials in the area of Intercultural and Development Education in collaboration with Irish Aid and the INTO. Think & Act is a pioneering web platform, designed for use in the primary school classroom and adapted for the digital ‘whiteboard’. 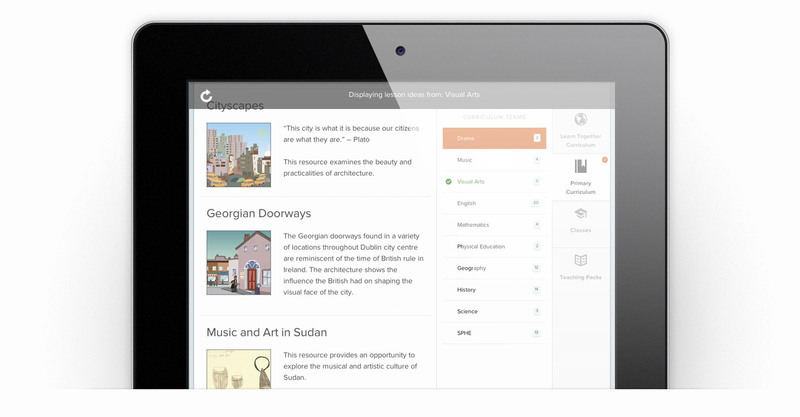 The first of its kind in Ireland, this digital platform offers easy access to Pivotal Arts’ (previously FOMACS) creative media content and other relevant curriculum resources and lesson plans designed by Educate Together. Educate Together schools are child-centred, communities where pupils learn together and parental involvement is encouraged. In an Educate Together school, children are equally respected, regardless of social, cultural or religious background. An ethical education curriculum is taught in place of religious instruction, which addresses the areas of Moral and Spiritual Development, Equality and Justice, Belief Systems and Ethics and the Environment. Critical thinking and active citizenship are emphasised throughout. Pivotal Arts collaborations with cultural organisations, universities, museums, galleries, schools, businesses, and the NGO sector are dynamic and catalytic, bringing newness to how socially engaged projects are brought to life and put out into the world. We experiment fresh ways of working with creative documentary and the web and design and develop public learning programmes, engaging new and existing participants and audiences.